One of my first experiences of using alkanet root (Alkanna tinctoria) was when I was asked to dye wool for making kneelers for a church in Wales. 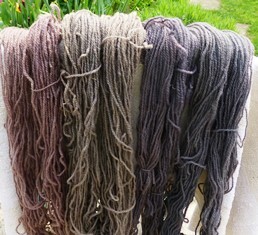 They wanted blue and a warm grey and from the dyed samples I sent they chose the colours from indigo and alkanet root. I was a little apprehensive, as I know alkanet doesn’t have the best reputation for light fastness, but as the kneelers would not be in much sunlight in their positions in the church and the customer was adamant she wanted to go ahead, I decided to risk it. This was about twenty years ago and as they were delighted with the results when the kneelers were completed and I haven’t had any complaints since, I assume the colours have remained pleasing. In our search for lavender and purple colours for South Downs Yarn, preferably using dyes grown in the garden or harvested locally, Louise and I decided to experiment with alkanet root. It is important to use dyer’s alkanet (Alkanna tinctoria) and not plants commonly called alkanet, such as common alkanet (Anchusa officinalis) or green alkanet (Pentaglottis sempervirens), which do not have the dye properties of dyer’s alkanet. It is not easy to source plants or seeds of Alkanna tinctoria, so we used dried dyestuff from France. According to what I had read, the red pigment in alkanet root is not water soluble and can only be extracted using something with a high alcohol content, such as rubbing alcohol. NB Great caution must be exercised when using alcohol, as it can easily catch fire and should not be used near a naked flame. Rubbing alcohol also has a rather unpleasant smell and gives off unpleasant fumes, so it may be advisable to wear a face mask to avoid inhaling these fumes. Some references indicated an alum mordant should be used so, although I usually use alkanet without a mordant, I mordanted some wool with alum ready for the tests. 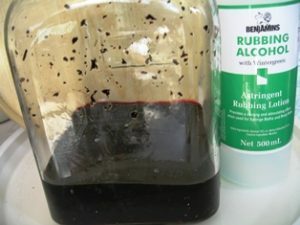 I steeped the alkanet root in rubbing alcohol for a week and the liquid became a deep red, which seemed full of promise. I strained the liquid into a dye pot, added more water and gently simmered the mordanted wool in this solution for about 30 minutes. 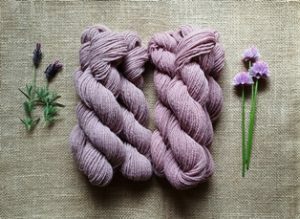 Initially it looked as if the red colour would be absorbed by the fibres but sadly this was not the case and when the wool was removed from the dye bath it was green and definitely not red or pink or purple. Although this was a pleasant colour, it was not what I had been aiming to achieve, so naturally I was rather disappointed. I wanted to try some more experiments with alkanet, this time without extracting the colour in rubbing alcohol, so I decided to follow a recipe I found in Gill Dalby’s book Fast or Fugitive. After simmering the alkanet root in water to extract the colour, I added a little clear vinegar, stirred well and then added the wool samples, both unmordanted and alum-mordanted. I also did a further test, this time without adding vinegar to the dye bath, and I applied an alkaline modifier, using soda ash, after dyeing. The results of these experiments confirmed what I had already discovered when dyeing with alkanet, namely that the results can be very variable and much seems to depend on the mineral content of the water used for dyeing. When I travelled around the country teaching workshops, I sometimes used alkanet and I could never predict what shades and tones of colour would emerge from the dye pot, as the colours varied considerably from area to area. The photo below shows the results of my tests. The first skein has a pink tone, although I wouldn’t describe the colour as pink; the second and fourth skeins (both alum-mordanted) have a green tinge and it would seem that alum brings out the green tones.